Fuzhou seafood rice noodle with red wine (small) - MYR20 - can taste the rice wine which is smooth unlike some strong chinese wine but the dish does not seem red in colour. Rice noodle is soft and I like the taste of the wine. Fish head noodle (1 pax) - MYR18 - tasty because they served Garoupa (sek pan) fish pieces in this dish and old strong tasting ginger slices. 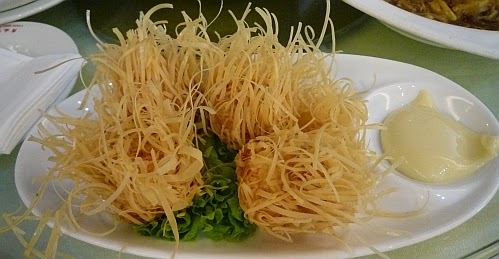 The prawns were compacted into a ball with a crunchy external layer of fried flour strips. 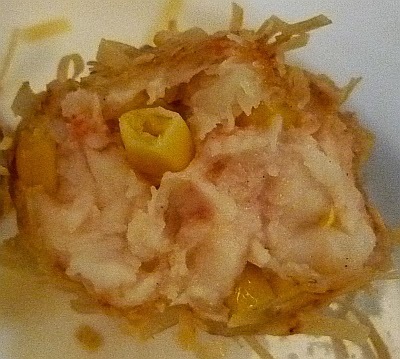 I was surprised to see corn niblets in the ball. 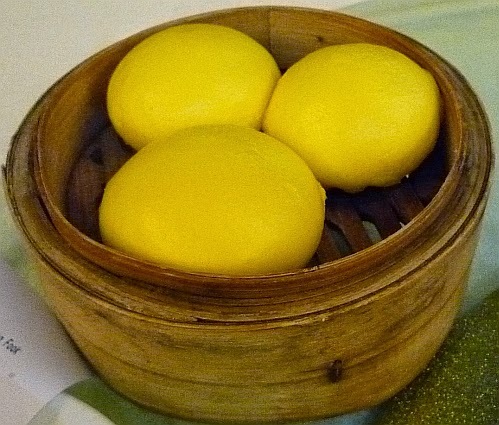 When I see this item on the Dim Sum menu, I must order it. Lao Sar Bao - MYR4.80 for 3 in a basket. Taste is acceptable. 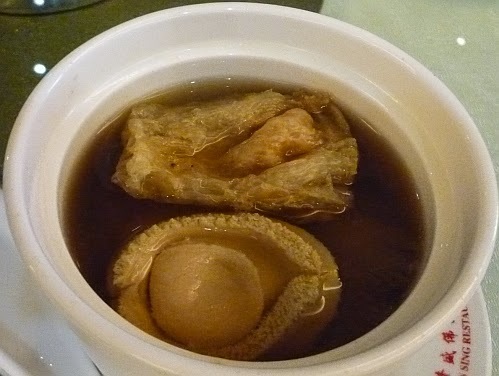 Also ordered pork siew mai - MYR5.80 for 4 in a basket. Don't like the siew mai because there were unknown chewy bits in the siew mai. This is the signature food of this restaurant so my friends decided to order them - the famous Loon Sing Buddha Jump Over The Wall soup. MYR49 for the cheapest bowl. 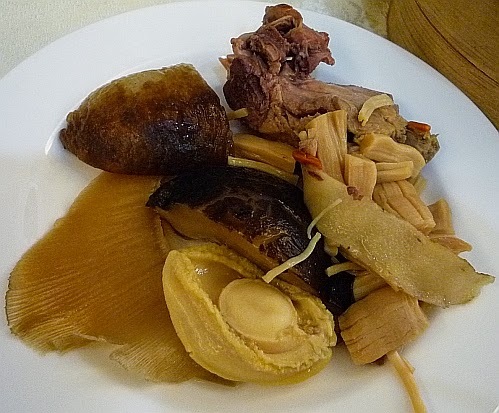 In the MYR49 bowl, there are half a piece of black mushroom, a mini abalone, dried scallops, a small piece of sea cucumber, a piece of chicken meat, and a thin piece of shark fin (I do not support eating shark fins but I do not impose my belief on my friends). 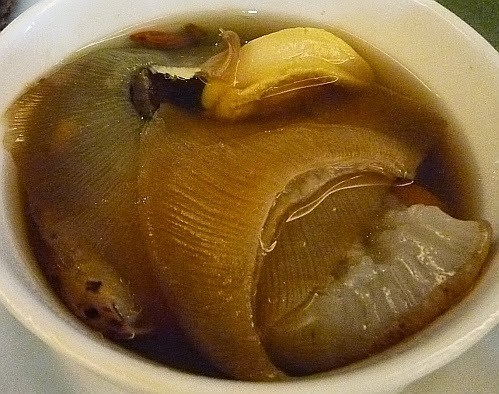 MYR69 per bowl (Loon Sing Mini BJOTW) - same ingredients but with 2 pieces of shark fin. 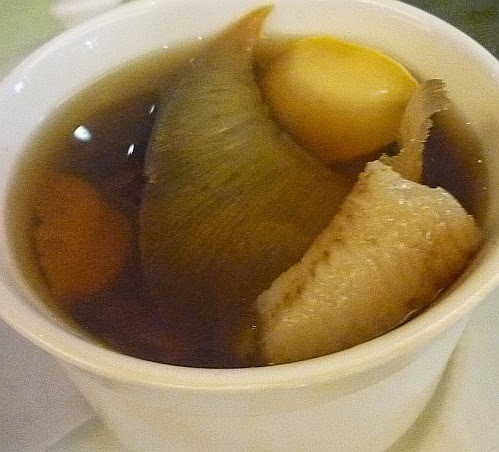 MYR99 per bowl (Loon Sing Superior BJOTW) - A much bigger abalone, fish maw, 3 pieces of thicker shark fin, and the rest of the ingredients are the same as the MYR49 bowl. The soup for this is nicer, less salty according to my friend. This is the size of the 'bowls' of BJOTW. They also offer a pre-booked BJOTW for 10 pax at MYR3000 - a large pot. Total Bill came up to MYR422.45 after adding 5% service charge and 6% gov. tax. Doesn't look anything Fuzhou that we have here but then again, we're not authentic - must be a different district in Fuzhou, China or Sitiawan Fuzhou. All the food looks so so so good.. 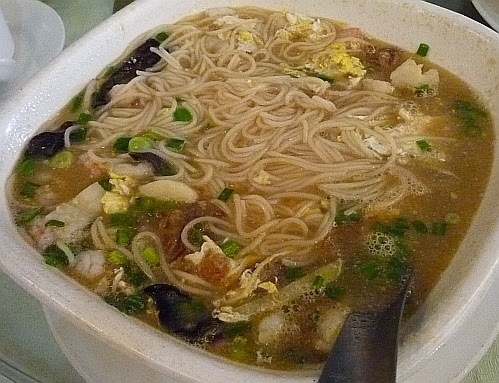 I like that fish head noodles and fuzhou fry noodles.. I can finish both, haha..
You don't like bao yu chi? They put Buddha JOTW in the bill. Sorry, dunno what you mean. RealGunners got a dirty mind! Those hairy crabs are cheap lo. I've had BJOTW before but don't know why but I'm not very excited about it. I'd rather have some other cheaper soups though I do like shark fin and abalone....maybe I don't like as much the herbal taste of the soup. 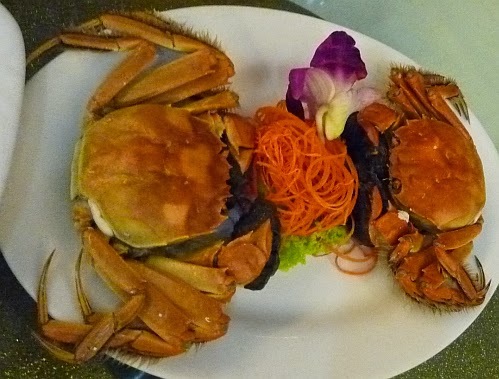 My friend says the hairy crabs are not as tasty as the ones she ate in China. I guess you like soups with a heavier taste. 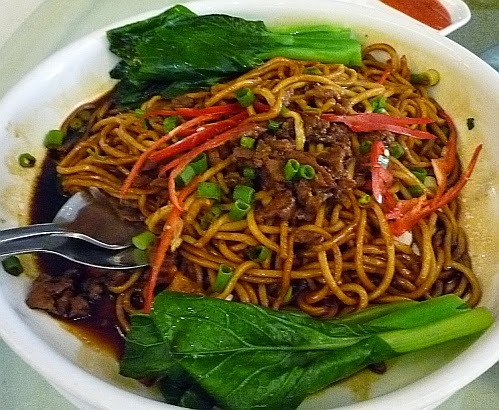 Mun, you are making me hungry right now! Good, go grab a bite! Haha but I don't eat shark fins if I can help it. Mun, you certainly got me drooling this time with the hairy crab & herbal soups. But how come the crabs so cheap one??? Got roe or not?? Hahaha! Goodness! 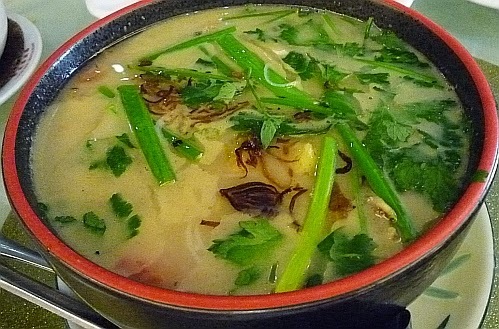 RM99 for a bowl of soup! That's expensive but I believe it is definitely good. 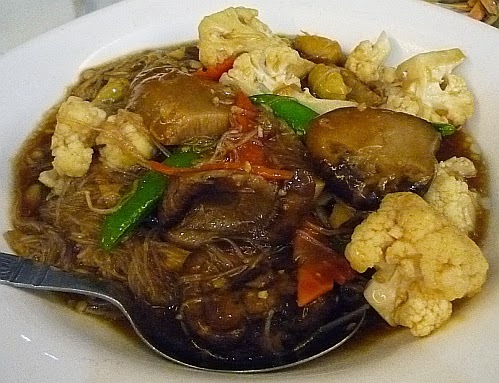 I think you would have eaten lots of bao yu chi so most like you have eaten the 3000 pot of this dish. 99 is kacang putih to you lah. The RM 49 Buddha Jumps Over The Wall dish looks good - it seems quite generous too for that price, with a small abalone to boot! I like what you said, you don't support it but you don't impose your beliefs on your friends. I feel that a lot of people nowadays just want to state they don't eat shark's fin (when they used to gobble it down) coz they're influenced by Western culture and they want to appear "cosmopolitan" in an effort to show they care about the environment when they actually don't - they just care about what people think of them now that eating shark's fin is passe. I will eat shark's fin if it's served to me and I will order it too if it's a speciality of a place e.g. 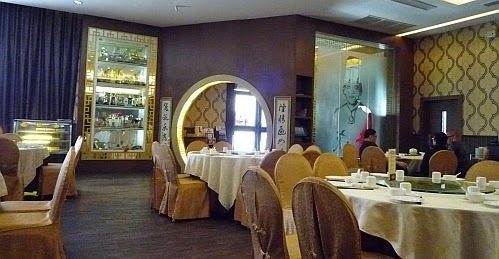 there are some 3 Michelin Star places in Macau which specializes in shark's fin soup. That's always been my stance and I don't pretend not to partake just to fit in, which a lot of people are trying to do now. I'm not saying everyone is like that, I'm sure a couple genuinely care for the environment but honestly, most of them only cares about the flak they'll get if they post about eating shark's fin. Sorry for the long rant. Haha. Good that you share your thoughts on this issue. Same goes for foei gras too.